If you are looking for top quality replacement parts at bargain prices and delivered fast, then you've landed in the right place. With over 28 years experience in the 4WD industry, we also offer great service and friendly advice. 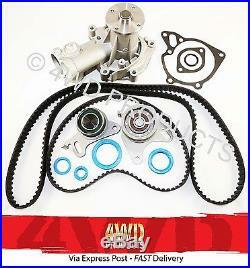 Water Pump / Timing Belt kit - MITSUBISHI Pajero NA-NG 2.3 4D55 (83-86) 2.5 4D56T (86-91). We deal with your order from go to whoa - we wont hand it to someone else overseas. This'Water Pump / Timing Belt and Tensioner kit' inc. 1x water pump + gasket/o'ring kit, 1x timing belt. 2x tensioner bearings, 1x timing seal set-4pcs is brand new and fits. Pajero NA, NB, NC 2.3 Turbo Diesel (SWB 3Dr Wagon/LWB 5Dr Wagon 83-86 , w/4D55 4Cyl engine). Pajero ND, NE 2.5 Turbo Diesel (SWB 3Dr Wagon 86-88 , w/4D56T 4Cyl engine). Pajero ND, NE, NF, NG 2.5 Turbo Diesel (LWB 5Dr Wagon 86-91 , w/4D56T 4Cyl engine). If you are unsure of your model, please feel free to consult with us. This kit includes high quality-standard (non genuine) replacement components. The water pump has provision for a'two bolt' thermostat housing, where as some models (intercooled) did have a'four bolt' thermostat housing and will not suit. We can supply the'four bolt' in place of the'two bolt' upon request. A licensed mechanic is to carry out replacement. NB: Colour of seals may vary, however quality is not compromised. We started out as a specialist 4WD workshop and parts supplier (GRP Auto) in Auburn NSW, back in the nineties, and even back then we were sending out parts all over the world to fellow 4WD enthusiasts the old fax machine ran hot! But the world has changed and many people prefer to shop online. Starting out with Suzuki 4WD parts (more about that later), we now offer quality, after-market replacement parts for most popular four-wheel drive makes and models. We stock and supply a huge range aftermarket parts for 4WD vehicles from: Nissan Toyota Mitsubishi Jeep Daihatsu Ford Honda Hyundai Holden Lexus Land Rover Mazda Subaru Ssangyong KIA Daewoo Lada yes, LadaNiva! Our aim is to get great quality spare parts out to you quickly and at a price that won't break the budget. Here in the office and warehouse, all of our staff (yes, even the coffee lady) are four-wheel drivers, so we understand how much your vehicle means to you. It may ferry the kids to school during the week, or sit in the car park while you do the nine-to-five thing, but come the weekend it becomes the centre of your recreational universe. We are happy to assist you with any enquiries you may have. Awesome we speak very fluent'Zook' around here! Our original beginnings were as The Suzuki 4WD Specialist and we like to think that we are able to supply a very'hard to get' range of parts for the LJ50 all the way up to the latest Grand Vitara. Please allow time for this if you require your parts urgently, or choose a more time efficient option. Most of our items are dispatched to Australian buyers via this option. Some small items (under 250 grams) may also be sent via Express Post envelope. EPARCEL STANDARD: In the event that an item is bulky and/or heavy, we offer Eparcel Standard. Whilst this method takes up to a few days more to arrive, it still offers the security of being trackable. If not, a card will be left and you will need to attend your local Post Office to collect your parcel. Please be advised that you will be required to sign a receipt to confirm that the item has been picked up, instead of posted out. INTERNATIONAL ORDERS We've sent out our products to just about every place in the world even Antarctica! Depending on the postal service you have selected, it can take anywhere from 1 to 7 weeks for your parcel to arrive (Registered Post International with Seamail being the slowest) and many of the lower priced options do not have tracking. We only use this option at your request or where it is the only service available, but we cannot be held responsible if your parcel does not arrive. Please consider a trackable service such as'Express or Courier Post'. REGISTERED POST - can take up to 6-7 weeks to arrive and is NOT able to be tracked. We only use this option at your request, and cannot be held responsible if your parcel does not arrive. Please consider a trackable service'Express or Courier Post'. EXPRESS POST INTERNATIONAL / EXPRESS COURIER INTERNATIONAL - it's well worth it to pay that little bit extra for a faster service that is able to be tracked. If your package goes missing, we can track it for you. It is only available for about 25 countries at present. Please ask us if you are unsure. Again, this is just to assist you. However, we are always willing to work with you to try and provide a satisfactory outcome. The item "Water Pump / Timing Belt kit Pajero NA-NG 2.3 4D55 (83-86) 2.5 4D56T (86-91)" is in sale since Monday, October 1, 2012. This item is in the category "Vehicle Parts & Accessories\Car & Truck Parts\Other". The seller is "4wd_products" and is located in North Parramatta. This item can be shipped worldwide.